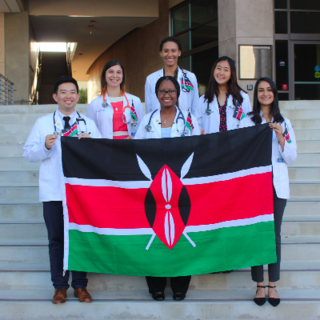 This summer, our team of medical and undergraduate students from UC Irvine School of Medicine will be traveling to Kenya and working on several community health projects. We will be in Kenya teaching life-saving ultrasound techniques to local health providers, providing free health screenings, and implementing a water filtration system to improve clean water access. More importantly, our goal is to create sustainable changes in these Kenyan communities through our projects. We hope to build a strong framework for each of these projects so that their impact is sustained beyond this summer. With your help, we can achieve our goals and more. To learn more about each of our projects and to follow our progress, please visit our website (under construction). 3) Heal: Provide care in conjunction with local healthcare professionals Your donations will go directly towards medical supplies ($4000), an ultrasound machine to donate ($6000), research supplies ($3000), and travel costs for the team of students ($7,000). Thank you for your support! Across the globe, contaminated water sources account for over 500,000 deaths per year. For 5 weeks our team of health care professionals and students will be providing medical services and education to disadvantaged patients in Machakos and Narok Counties. In these areas, villagers have to walk miles for unclean water. These villages are in great need of access to clean water, medical supplies, and health care. As part of our initiative with the Water Project, we will donate medical supplies, including an ultrasound machine, and teach communities about hygiene and water safety. Additionally, we will use ultrasound technology to better assess dehydration risk factors and prevalence of waterborne diseases in the area.